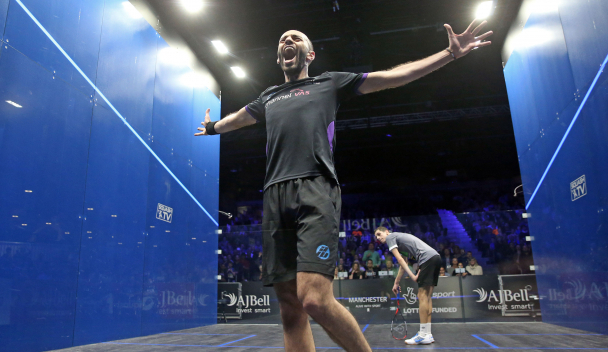 Egypt’s Mohamed and Marwan Elshorbagy will become the first siblings in history to face each other in the final of the Men’s AJ Bell PSA World Championship. The women’s competition will also see an all-Egyptian final as Nour ElSherbini will take on comaptriot Raneem El Welily at Manchester Central Convention Complex. World No.2 Mohamed reached the final after beating World No.1 Frenchman Gaultier 3-0 (12-10, 11-4, 11-9). This marks Mohamed’s third World Championship final, while his younger brother Marwan – current World No.5 – will be playing his first World Championship final after he defeated Egypt’s World No.3 Ali Farag 3-2 (11-8, 4-11, 9-11, 11-7, 11-9). “This is for our family. Two brothers in a final, I don’t think it has ever been done before. We’re so close to each other and it is a dream for both of us and these are the kind of things you visualise when you are young, it’s a dream come true,” Marwan told PSA World Tour website. Meanwhile, the women’s final will see World No.1 ElSherbini target her third successive World Championship title after beating compatriot and World No.8 Nour El-Tayeb 3-2. World No.2 El Welily’s road to the final was easier as she managed to overcome World No.3 Camille Serme 3-0 (11-7, 11-9, 11-7). “El Sherbini is such an exciting player to watch,” said El Welily, who also fell to a defeat in the 2014 final against Malaysia’s Nicol David,” said El Welily who’ll be facing El Sherbini in a repeat of April’s World Championship final in El Gouna. “She’s very skilful with the racket and you never know what she’s going to hit next. these are great times for Egyptian squash. The women’s game is very exciting at the moment, people are moving in and out of the top eight every month,” she added.